These are the common reactions I get when I explain what Dorm Room Dreamz L3C (DRDz) is all about. To be honest, I didn’t pay much attention to homelessness when I was in college. Homelessness looks very different on college campuses, where students experiencing homelessness are harder to identify. 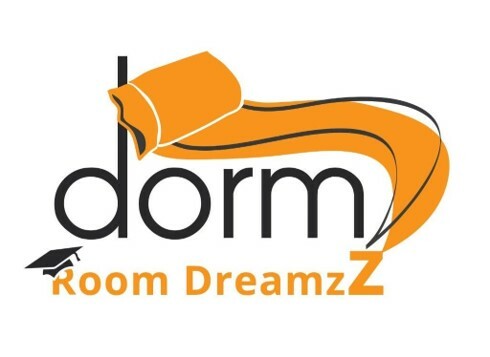 But my career path set me on this journey, long before I knew I would be the founder and CEO of Dorm Room Dreamz L3C. I received my bachelor’s degree in Social Work from State University of New York (SUNY) Buffalo State and worked in a homeless shelter for four and a half years. As the supervisor, I oversaw multiple homeless programs, including Shelter Plus Care for seniors and young adults, Men’s Mental Health Board & Care Facility, a family transitional shelter, and an emergency shelter. By working in these programs, I came to fully understand the cycle of homelessness as it relates to mental illness and families. While working at the shelter, I completed my Master’s degree in Post-Secondary Educational Leadership, specializing in Student Affairs, at San Diego State University. I then transitioned into higher education and became the Founding Director of Single Stop at two community colleges in Louisiana. I connected students to resources and helped them remove barriers to higher education. I mistakenly thought my days of working with homelessness were over. I discovered, however, that student homelessness was a critical matter on campus because there were no services to assist these young people. Using my previous experience in homeless services, I researched options for students. I found that there were frequent limitations in traditional shelter programs. I realized homelessness was just as prevalent on college campuses–just not as visible. For five years at Single Stop, I went above and beyond, connecting students to shelters and housing programs. I drove students to shelters and I paid for meals and other expenses out of my own pocket. But not every college has a “Brandy” or someone willing to step in. In many cases, I was lucky in finding shelter or housing placements–but what about the students that didn’t come to my office or didn’t seek help? Then came the week that I will never forget: I call it my “decision week.” Every single day of that week, a student came into my office, hopeless and homeless. By Thursday, I couldn’t take it anymore. I knew I had to do something. I realized the unmet need and lack of resources, and I began developing a solution. I pulled from my experiences as shelter supervisor and as a director in higher education. From there, Dorm Room Dreamz was born. DRDz is an organization dedicated to cultivating awareness and prevention of collegiate homelessness. Just as academic and financial counselors guide students through enrollment and aid processes, housing counselors are professionals who guide students through the housing process, which can be just has difficult as applying to college. We use specialized College Housing Plans (CHP) to successfully place students in housing environments that support higher education. 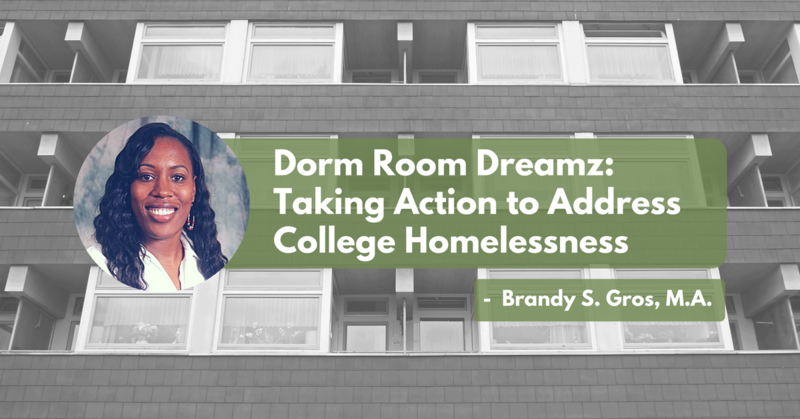 DRDz’s mission is to work with colleges, students, and community housing agencies to better prepare students who have housing hardships to remain enrolled in college. At DRDz, we know some students just need a place to have “Dreamzz!,” and that housing hardships, such as evictions and homelessness, impact a student’s learning capabilities and make it difficult to stay enrolled. Before DRDz’s implementation, I helped approximately 75 students. I know that through this program, we can assist many more. One story that sticks out in particular was an older female student taking prerequisites for her nursing program as she was going through a separation from her husband. One day the situation escalated into domestic violence. She fled the home she shared with her husband and two children, where he was the only source of income. I was able to help place her in a temporary shelter, apply for public assistance benefits, and connect her with legal services during our weekly check-ins. She was a very determined woman and found a job quickly, and within in a few months, she was able to afford her own apartment and provide for her children. DRDz provides services related to Pre-College, Higher Education, and Affordable Housing. Higher Education – Housing Hardships = Success! College and universities may not be aware of the extent to which college students experience homelessness, and therefore may not have definitive protocols for identifying and assisting this population of disadvantaged students. DRDz understands that colleges and universities are critical partners in addressing collegiate homeless students but may not have the necessary resources and a homeless service provider is key in offering a solution. DRDz understands the “struggling college student” is truly struggling every day to meet his or her basic needs. College students most in need of housing have little to no options and most likely do not meet the criteria for “traditional shelters,” or they are placed at the end of long waitlists. This is why DRDz will create its own housing facility for college students. Dorm Room Dreamz L3C, is based in Baton Rouge, Louisiana and is more than just another student housing program–it’s an organization that provides placements for students with NO housing! We invite you to explore our dynamic and diverse community and to grow with us!